Glenn Lewis is an Auckland based Psychic, Medium, Healer and Spiritual Artist at Ascension Healing. 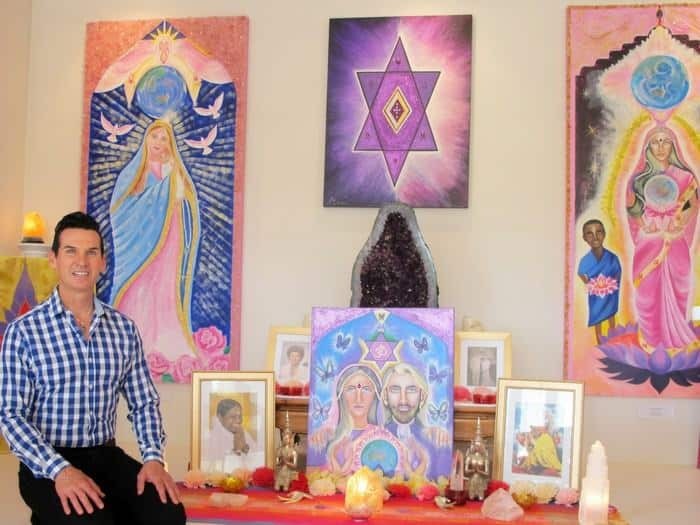 Along with connecting you to your guides, guardians and loved ones, he also works strongly with the Ascended Masters. The Ascended Masters are beings who are connected to our planet and are here to help guide us into a higher understanding. Although there are many Masters working with us to help us to ascend and develop our awareness of Peace, Love and Truth, 13 of the Ascended Masters are holders or Cohan’s of the Ascended Master Rays. The rays are like an energy which also holds a vibration and a colour. Each of us is born under a certain ray as part of our life purpose. All the Master’s also work within the rays, helping us and our planet by bringing through wisdom, knowledge and understanding of healing, Love and peace. The 13 Ray Masters began working with us in Atlantis. Each of us has a Soul Purpose that we have chosen as our life path. Ever since he was young, Glenn has been able to see and talk to Spirit. As he has developed and connected with the Ascended Masters they have taught him how we can and need too, release past life connections, heal and release things that have happen to us in this life and in past lives and how the mind-body relationship creates blockages. During a healing or reading, Glenn receives direction and guidance from your guardian, guides and the Ascended Masters to help release pain, hurt, suffering and to clear past life issues. Glenn works from the ‘temple’ at his home, a wonderful and peaceful 5 acre property in Muriwai, West Auckland which has been named Ascension Gardens. Readings or Healing are also available via Skype. Are you seeking a psychic reading to understand your current predicament? Feel blocked? Know that you can be healthier, happier and more at peace? Glenn offers different spiritual healing options to suit anyone who is seeking a better understanding or deep healing to resolve past issues. For many of us, past lives, childhood issues, spiritual connection with parents and family and our own growing psychic ability can all affect our lives. Glenn brings his spiritual healing to help you understand and connect, release and heal. To view the readings and healing on offer or to book online for an appointment, visit our Readings & Healing Page here. You can also receive regular channeled messages from the Ascended Masters by subscribing to our newsletter at the bottom of this page, or our Facebook page.